What Is the Best Technique for My Rhinoplasty? Your nose serves as the anchor to your facial features since it is located at the center of the face. Due to its prominence, there is little surprise that a misshapen nose can be detrimental to your self-image and confidence. Rhinoplasty is the term used for the surgical alteration of the nose that can include removing a bony hump, narrowing a wide bridge, raising a drooping nasal tip, or correcting the damage that an injury may have created. Whatever the cause of the dissatisfaction, rhinoplasty can help you achieve a nose that will balance your features and bring symmetry and harmony to your entire face. While the exact techniques used for your rhinoplasty will depend on what is being altered—cartilage and bone can either be removed or added to sculpt the nose—your surgery will be performed using an open or closed approach. The open rhinoplasty technique is a much newer and more modern approach to the traditional “nose job.” With this option, a zig-zag incision is made along the columella (the skin and cartilage between the nostrils), before the skin on the nose is lifted and pulled back. As open rhinoplasty is considered the “modern” approach, closed rhinoplasty can be known as the traditional one. Using this technique, the incisions are made inside the nasal passageways instead of along the columella, leaving the exterior of the nose intact. 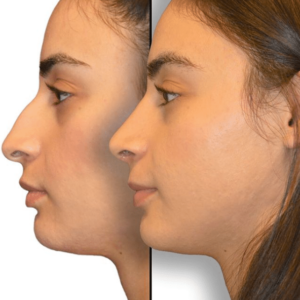 While both the open and closed rhinoplasty approach can be applied to virtually any nasal concern, the right technique will come down to both you and your surgeon’s personal preference. The closed technique is often requested by men and women who don’t want to have any visual scarring. While the closed approach has been around for decades and created beautiful results, it is known as the “blind approach” because it doesn’t allow your surgeon to have full visibility of what he is working on. Just because there is a lack of visibility doesn’t mean that ideal results cannot be achieved in the hands of a skilled surgeon like Dr. Diamond. It only means that there may be a slightly increased risk of complications. The open approach does allow for full visibility of the internal structure of the nose. It is this technique that Dr. Diamond prefers, as he can easily determine what the problem with the nasal structure is. The open approach often results in a lower revision rate, and while a scar is visible, it is minor and heals well. There is no definitive winner when it comes to the open and closed approach debate; it is all about personal preference. If you would like more information about rhinoplasty techniques, or to schedule a consultation with Dr. Diamond, please call our office at 310-859-9816.